Young Table Tennis rising star Ibrahim Gedo has received tons of commendations from the sports fraternity for his courage and determination at the recent world cadet championship where he won gold for Ghana in the boy's category. 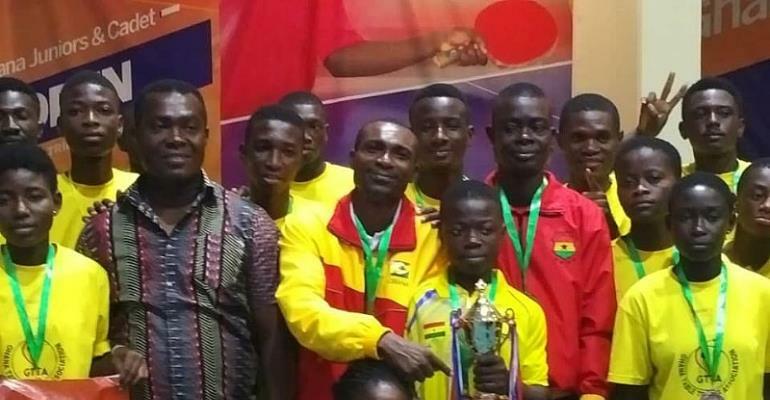 President of the Ghana Table Tennis said he is a star for the future and national coach Eben Annang-Whyte said he has done the nation proud by winning a gold medal at a world championship and he should be honoured by the media. “I know SWAG are seeing this great achievement, I see it as a great honour for me personally as a coach and am glad he won for Ghana and Africa,” he said. "This kid is a game changer breaking barriers in ongoing @ittfafrica @ittfworld cadets championship in Ghana, this lad grab the gold medal well done young champ. Great work @mawuko.gh and all the GTTA staff. I’m super excited for the fact that this young champ stand tall with the trophy absolutely buzzing for the kid just loved it. Gold medalist yes you heard me Ghana for gold medal." Derek Abrefa, the current national top seed said Gedo Ibrahim must be encouraged with more exposure. He added that the young player must be made to travel to play in tournaments to give him confidence and experience as he has the potential to become a world star.